101 Ways to Save Money on Your Tax — Legally! is the tax guide every Australian should own. Packed with tips, answers and instructions from Mr. Taxman himself, this book shows you how to pay exactly what you owe — and not a single cent more! Individuals, investors, business owners, pensioners and more need clear advice targeted to their unique tax situation, and this guide delivers. From superannuation, medical expenses, levies, shares and property, to education, family and business, Adrian Raftery can show you how to leverage every deduction to keep more of your hard-earned money. This new edition has been updated for the 2019-2020 tax year, giving you the inside scoop on the latest changes to the tax codes and how they affect your specific situation. Keeping up with constantly-evolving tax laws is a full-time job — but it’s not your full-time job. Let Mr. Taxman do the legwork and bring you up to date on what you need to know. You may be overpaying! Many Australians do, year after year. This book shows you how to determine what you actually owe under current laws, and how to set yourself up for better savings next year. You work hard for your money, so why not keep more of it in your pocket? The advice in this guide may save you hundreds — or thousands — this year alone. When it’s time to file your tax, don’t go it alone. 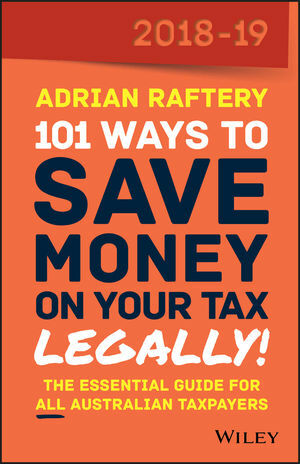 Get Mr. Taxman on your side and make this year your best filing yet using 101 Ways to Save Money on Your Tax — Legally!